The State Library has remained on the same two-acre allotment since its opening in 1856, but the structure you see today is actually made up of 23 individual buildings that have changed dramatically over the years. The Melbourne Public Library (as the Library was originally known) initially took up a much smaller part of our city-block site. When it was officially opened on 11 February 1856, the building consisted of the central portion of the current Swanston Street frontage. The impressive portico that completed architect Joseph Reed’s original design wasn’t added until 1870. 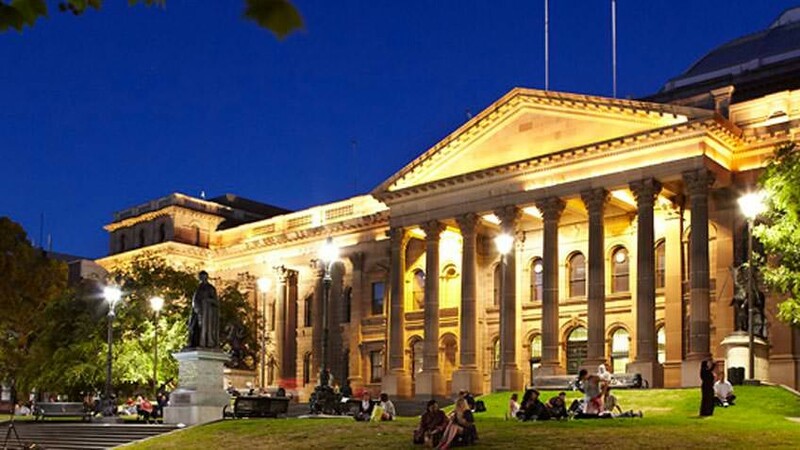 The current Library site is also the birthplace of Melbourne’s first Exhibition Buildings, the National Gallery and the Melbourne Museum. For a period of time from 1892 the Library offered a lending library service, most recently located in what is now the Mr Tulk cafe. 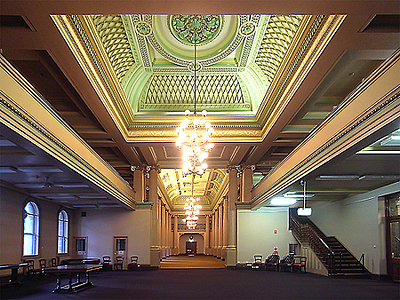 The magnificent Queen’s Reading Room (now known as The Ian Potter Queen’s Hall) was originally half its current size. In 1864, an extension to the original building lengthened the room to provide the 26 bays still in place today and a long central area to accommodate readers. The majestic Dome that towers above the Library’s facade didn’t exist until the early 20th century. This space was originally occupied by the Rotunda and Great Hall of the Exhibition Buildings, which were built to host the 1866–67 Intercolonial Exhibition. They were planned as temporary structures, but served a variety of purposes until being demolished in around 1910 to make way for the domed La Trobe Reading Room, which opened in November 1913. Like to know more? 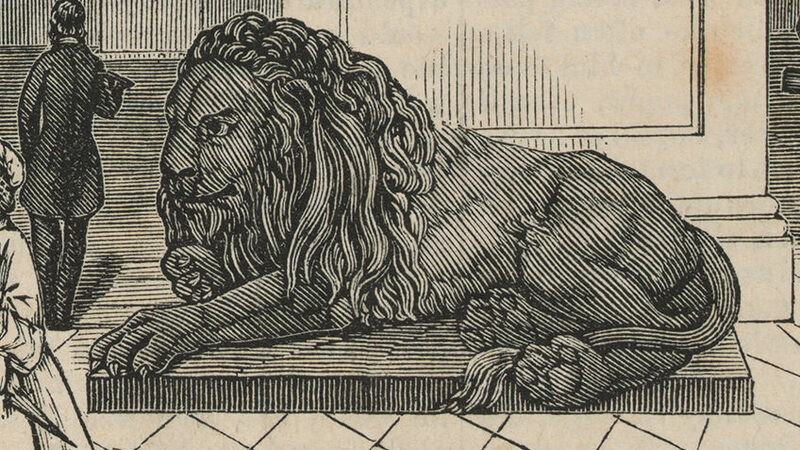 Take a look at our research guide on the Library building. Beyond our walls lie a number of iconic features with their own stories – some of which, such as the Architectural fragment sculpture, are as instantly recognisable as the Library building itself. When the Library opened in 1856 a picket fence surrounded the lawn, which was mostly covered by shrubs and trees. Visitors entered the grounds through a gate on Swanston Street before climbing the stairs to the wooden front door that still forms the Library’s main entrance. The pickets were replaced by wrought iron in 1873, the fence removed altogether in 1939, and the shrubs and trees cleared away over time to create the open lawn. 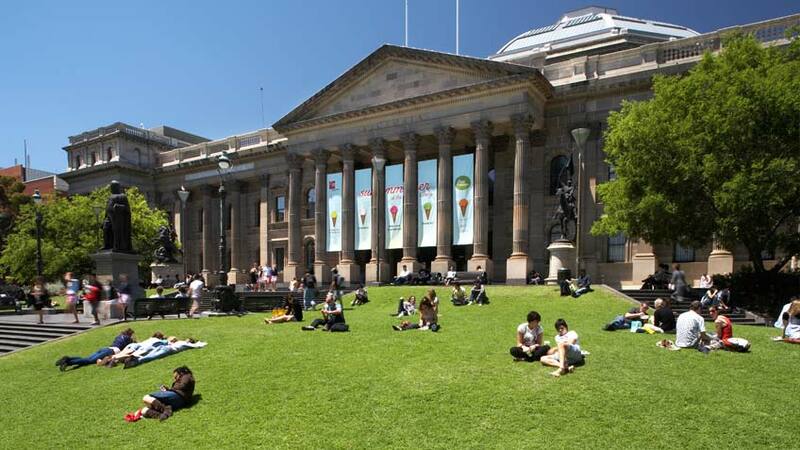 Today the lawn is one of Melbourne’s most popular places to meet up and relax on a sunny day. Set into the pavement outside the Library, on the corner of Swanston and La Trobe Streets, Architectural fragment by Petrus Spronk is a modern bluestone sculpture of a great institution in ruins. 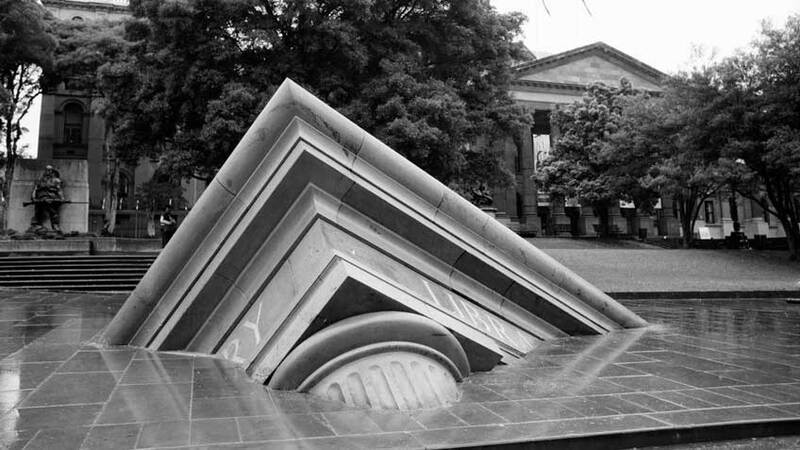 The sculpture was installed in 1992 and is based on a detail of the Library's portico. 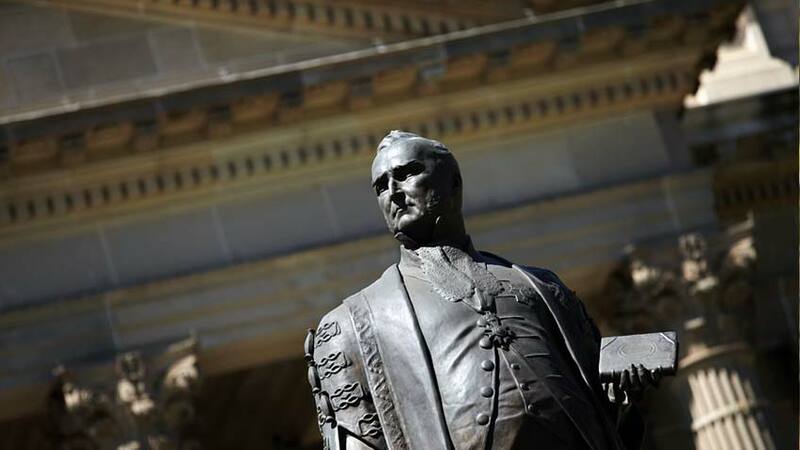 At the northern end of the lawn is a statue of Lieutenant-Governor Charles La Trobe, the first lieutenant-governor of the colony of Victoria. La Trobe was also one of the Library's founders, establishing the Melbourne Public Library in 1853, and he is depicted reading the proclamation of Victoria’s separation from the colony of New South Wales. 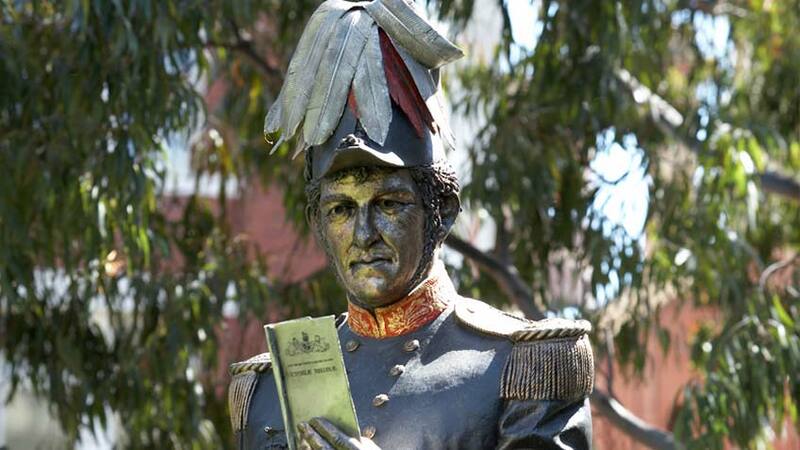 The statue was commissioned by the La Trobe Society to celebrate the National Trust’s Year of La Trobe, 2006. 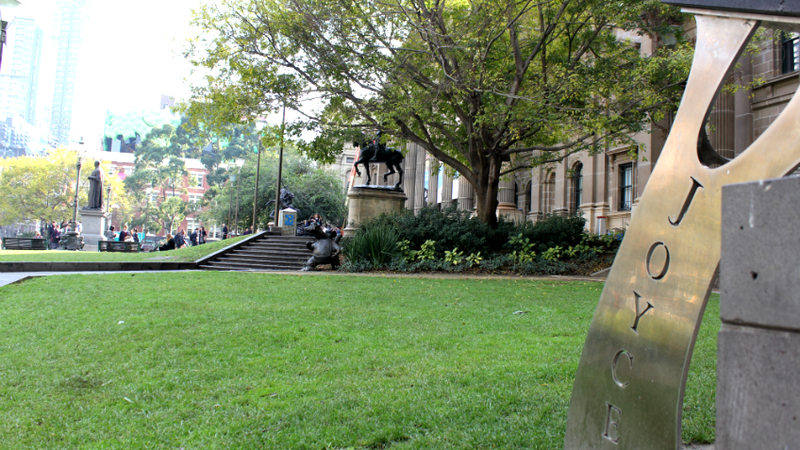 Sculpted by Peter Corlett OAM, it was unveiled by the then-Governor of Victoria, Professor David de Kretser AC. Our statue of Sir Redmond Barry welcomes visitors to the Library from his prominent position in the middle of the entrance steps. Barry founded some of Melbourne's most famous public institutions, including the University of Melbourne and Royal Melbourne Hospital. Modelled by James Gilbert and completed by Percival Ball after Gilbert's death in 1885, the statue was erected in 1887, seven years after Sir Redmond Barry's death. 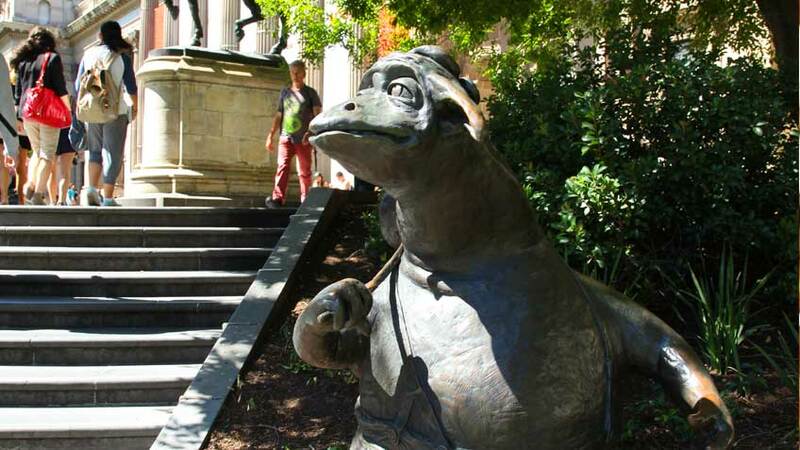 Beside the steps on the southern side of the Library forecourt is the bronze statue of the titular character from Jenny Wagner's book The bunyip of Berkeley's Creek, created by Ron Brooks at the Meridian foundry in 1994. The sculpture came into the Library's care as part of the Scholastic Dromkeen Children's Literature Collection in 2012. Another Dromkeen statue can be found beside the steps on the northern side of the forecourt. Called Mr Lizard and gumnut baby, it depicts characters from May Gibbs' Snugglepot and Cuddlepie, beloved by generations of Australian children. The bronze sculpture was created by Smiley Williams in 1998. The world's second James Joyce Seat of Learning was unveiled on the Library's forecourt on 26 August 2004. Christened by Irish writer Colm Tóibín, who was in town for the Melbourne Writer's Festival, the seat incorporates a brick from James Joyce's childhood home in Drumcondra, Ireland. Designed by Rick Dalmau of Dalmau Designs, the seat's installation was organised by Mary Dalmau of Reader's Feast bookstore, who was inspired by Dubliner Brendan Kilty’s quest to preserve relics from James Joyce’s former home. After purchasing 18 truckloads of bricks when the Joyce house was demolished some years ago, Kilty established a series of Joyce Seats of Learning around the world – each incorporating one of the bricks. The first chair was unveiled in Kuala Lumpur, and others can be found in Toowoomba and New Camden, New Jersey. Take a tour of our beautiful galleries and heritage spaces. For updates on the Library's redevelopment project, visit the Vision 2020 microsite. 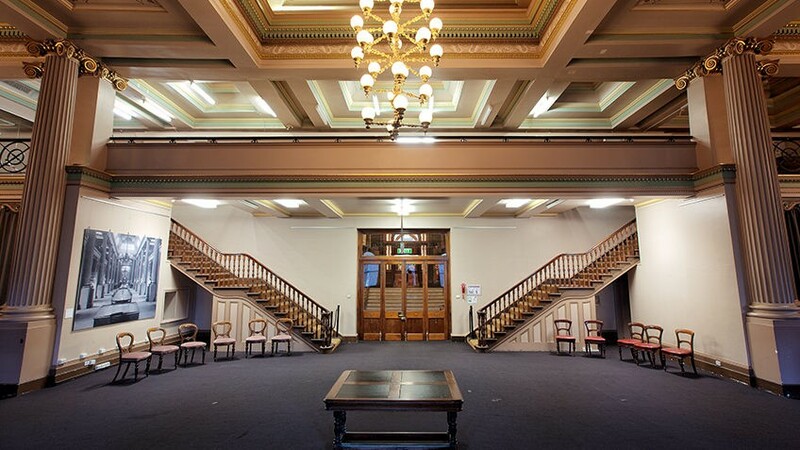 Our magnificent spaces are perfect venues for special events and functions. Find out more.